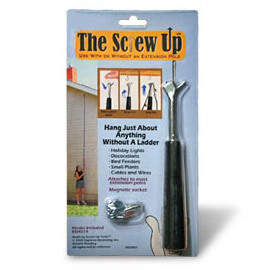 The Screw Up® is a new, patented tool that allows you to install screw hooks using an extension pole. Simply twist The Screw Up® onto an extension pole, place a round screw hook into the magnetic socket, lift and turn. To hand an object on the screw hook, use the hang tool built onto the tool. It is the fast and safe way to hang just about anything in high places, WITHOUT a ladder.